Sunday 10 ANNOUNCER This has been very interesting, Mrs. Schramm and Mr. Trapnell, but I'm afraid our time is up. Ladies and Gentlemen, KBUR has brought you a 15-minute public service broadcast on atomic energy, as part of Burlington's atomic energy week. 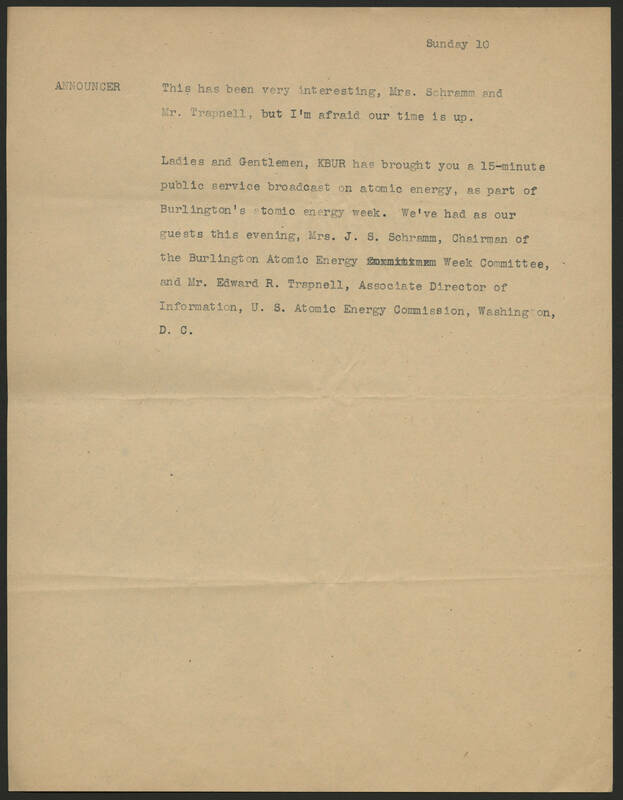 We've had as our guests this evening, Mrs. J. S. Schramm, Chairman of the Burlington's Atomic Energy Week Committee, and Mr. Edward R. Trapnell, Associate Director of Information, U. S. Atomic Energy Commission, Washington, D. C.